Rainy today. Decided to do some inside work. After nine years in the new house finally got rid of the OSB scrap that rested on the back of the sink. It was developing some black mold on the bottom. Not the best where beer is fermented. Back splash if three-eighths inch thick. Same composition as some synthetic cutting boards like the one hanging on the left side. The cabinet on the right goes this winter as soon as I have the new shop organized. Wish I had the room to do that. I'm stuck with my basement laundry room and no room to expand. I do have cabinets for storage and counter space but really nowhere to hang and store the bigger equipment. There is also a huge old double wide stove in the room that I have used in the winter for partial boils. That came in handy but that was the only time I have ever used it. Drives me crazy that I cant always organize my stuff the way I want to. It's a sealed system. Wouldn't want to take the chance of introducing an air bubble. The tubing probably wouldn't withstand mash temperatures for too long either. I, too, have hydronic heat. They are really simple to bleed. 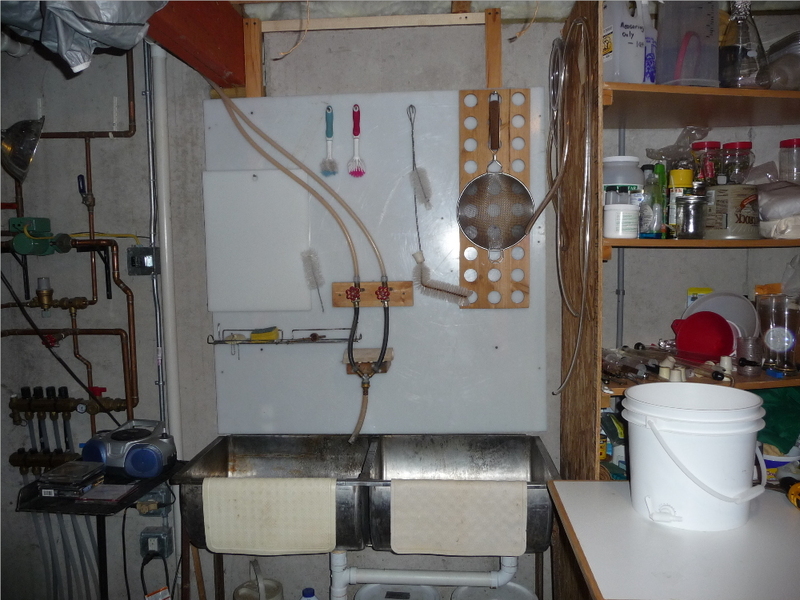 Very nice hydronic system I am assuming that is for in floor heat in your basement? Right. Even heat source for managing fermentors. Feels good too when not wearing shoes.